Your Apple Watch includes apps for a variety of communication, health, fitness, and timekeeping tasks. You can also choose to install third-party apps you have on your iPhone, and get new apps from the App Store. All your apps are on a single Home screen. Note: When you get a new app from the App Store for watchOS, the iOS version of the app is installed on the paired iPhone. Tap My Watch, tap General, then turn off Automatic App Install. Tap My Watch, then scroll down to Available Apps. Tap Install next to the apps you want to install. Tap App Store to browse Apple Watch apps. Tap the purchase button to download the app. Tip: If you know the name of the app, use Search to get to it quickly. 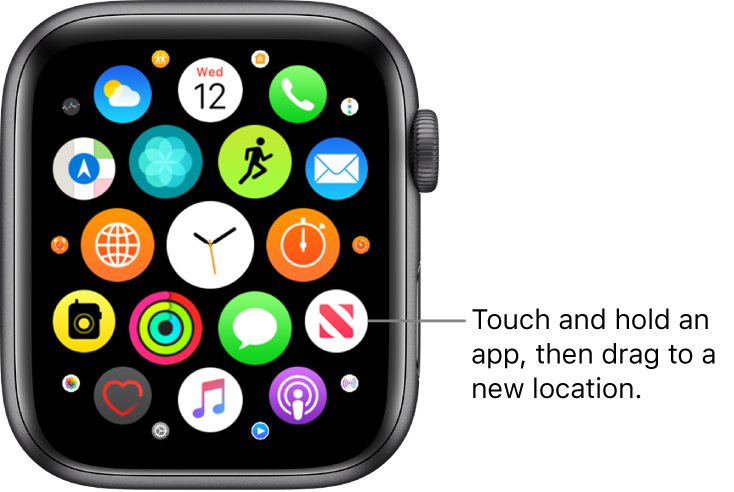 On your Apple Watch, press the Digital Crown to go to the Home screen. If the screen is in list view, firmly press the display, then tap Grid View. Touch and hold an app until they all jiggle, then drag it to a new location. Press the Digital Crown when you’re done. Or open the Apple Watch app on your iPhone, tap My Watch, then tap App Layout. Touch and hold an app icon, then drag it to a new location. Note: In list view, apps are always arranged in alphabetical order. 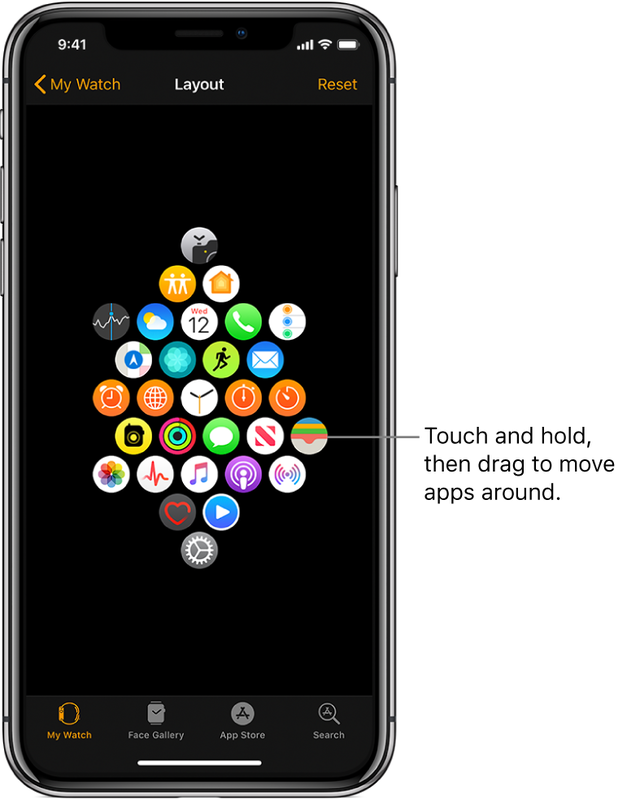 Grid view: On the Home screen, touch and hold the app icon until you see an X on the icon, then tap the X to remove the app from your Apple Watch. It remains on your paired iPhone, unless you delete it there, too. List view: Swipe the app left, then tap to remove it from your Apple Watch. It remains on your paired iPhone, unless you delete it there, too. Tip: You can remove an app from your iPhone and Apple Watch at the same time. 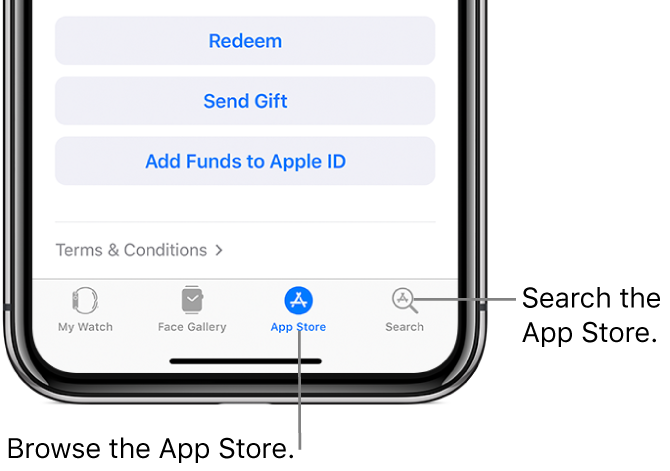 On your iPhone, touch and hold the app icon until you see an X on the icon, then tap the X to remove the app from your iPhone and Apple Watch. To restore an app that’s been removed, download it to your iPhone from the App Store. Tap My Watch, then scroll down to see apps you installed. Tap an app to change its settings. Some restrictions you set on your iPhone in Settings > Screen Time > Content & Privacy Restrictions affect your Apple Watch also. For example, if you disable Camera on your iPhone, the Camera icon is removed from the Apple Watch Home screen. Tap My Watch, then go to General > Usage.